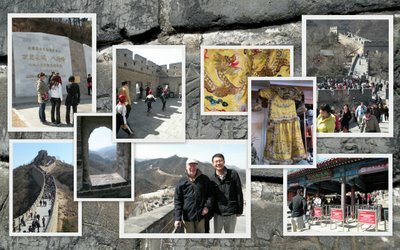 The Badaling portion of the Great Wall of China - completely restored - is the section most frequently visited by tourists. In other areas, parts of the wall have crumbled and all but disappeared. To restore the entire length of the wall to its former condition would be a monumental task - and to what end? Even when it was built, apparently, it did not serve its purpose as a defense against invaders – and it certainly does not today, in this age of airplanes. Our tour guide Mike told us that the entrance facilities had been recently upgraded and the hordes of hawkers and beggars who formerly frequented the place have been kept away. The general impression is of a very clean and modern site. As was the case at the Forbidden City, there were thousands of Chinese visitors at the Great Wall, often in groups. Mike explained that at the height of the season, traffic is very congested. It was busy today, he thought, but not unpleasantly so. We walked for about a mile along the top of the wall, most of it uphill - stopping far short of the highest point - then back down the same way. There are very few ‘steps’ on top of the wall so on the way down it is not easy to keep one’s balance or control one’s forward motion. Not a place for visitors unable to cope with a challenging walk. In the afternoon we went to the famous – some might call it ‘infamous’ - Silk Market. We had been travelling with two large suitcases and two small carry-ons. With acquisitions along the way, the suitcases had become far too heavy to be acceptable by the airlines. No problem if the weight is divided into two checked bags. We got some cheap ($10 each) duffel bags on wheels and divided the stuff accordingly. The Silk Market is very popular with western tourists, but it is a pretty odious place. Each stall is tended by one or two young girls (usually) who solicit the approaching customers like prostitutes. Some even grab the customers by the arm and refuse to release them until they buy. Bargaining is part of the process. Marked prices mean nothing and the haggling is endless. Rumor has it that this place is run by a criminal organization and that the girls are under tremendous pressure to meet quotas. This market is not, in fact, a ‘silk’ market at all; nearly everything in the hundreds of stalls of this claustrophobic building are knockoffs of famous brand name manufacturers of shirts, clothes and bags of all kinds. The government raids this market from time to time to try to keep the phony stuff from being sold. One possible solution under discussion is to have these vendors clearly label the knock-offs as imitations and pay licensing fees to the brand name manufacturers whose products are being copied. Although we found ourselves caught up in the bargain-hunting, it is probably unworthy of foreign tourists to be doing business in such places just to buy cheap stuff that has nothing whatever to do with China’s own traditions. At other locations in shops run by the government one can find excellent products such as silk rugs, shirts and bedding. The products are guaranteed and the prices are very reasonable and fair. In fact, we did purchase a beautiful Han Dynasty design silk carpet at one of these stores. If You Haven't Been Already - You Must Go Soon! Planning a visit to China? Don't hesitate! You will step into a modern and largely tourist-friendly "new" Zhongguo (Middle Kingdom). Based on our experiences in Beijing several of the publications we had consulted before travelling were very useful. The Eyewitness Travel books published by Dorling Kindersley Publishing are superb, not only for Beijing but for many other destinations as well. For current information about Beijing and what is happening there from an expat point of view seek out the English-language magazine City Weekend. It is full of useful and detailed information about restaurants, clubs, concerts and exhibitions. Next in China Diary: Talking about Stokowski at two of Beijing's leading music schools.